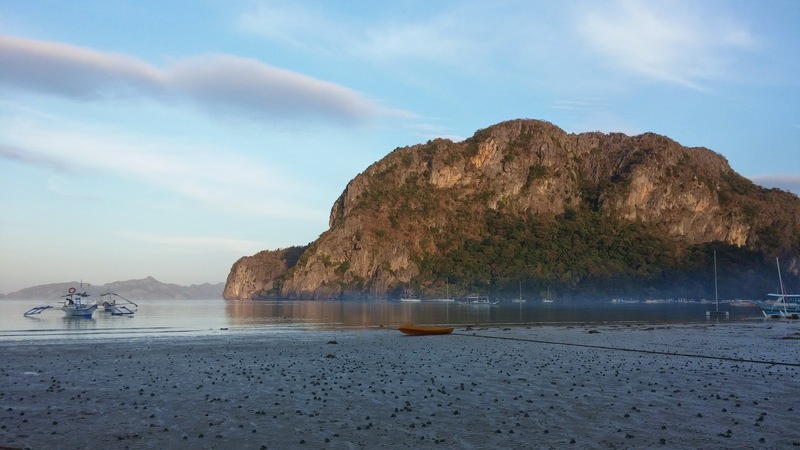 Adventurous Feet: SM Hotels Dream Destinations! Summer isn’t over yet! 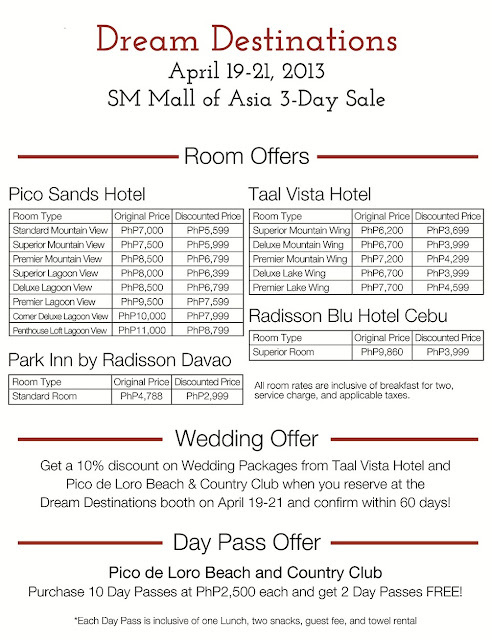 Get up to 40% off on hotel gift certificates and the chance to win free vacation stays from SM Hotels and Conventions Corporation properties: Taal Vista Hotel in Tagaytay; Pico Sands Hotel at Pico de Loro Cove, Nasugbu, Batangas; Radisson Blu Hotel Cebu; and Park Inn by Radisson Davao at the 3-Day Sale of SM Mall of Asia on April 19–21, 2013. Visit the Dream Destinations Booth at the Main Mall Atrium (Near Starbucks and Mango), Ground Floor, SM Mall of Asia. 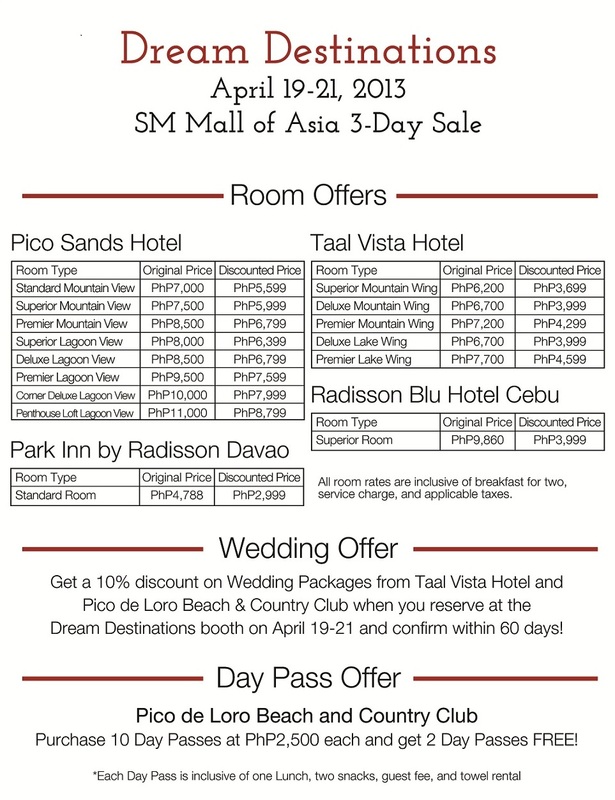 Taal Vista Hotel, Pico Sands Hotel, Radisson Blu Hotel Cebu, and Park Inn by Radisson Davao are part of the property portfolio of SM Hotels and Conventions Corporation, a subsidiary of SM Investments Corporation. 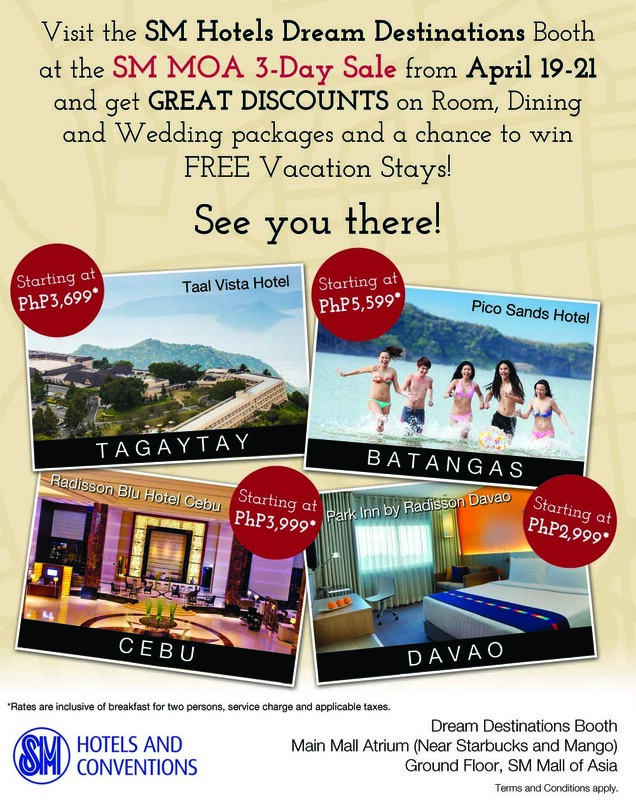 The company aims to bring world-class service stamped with a unique brand of Filipino hospitality to customers through its hotels and convention centers. The company also operates SMX Convention Center in Manila, SMX Davao, and Pico de Loro Beach and Country Club in Nasugbu, Batangas. It is set to open another convention center at the heart of Metro Manila, SMX Aura in Taguig, this year and the first Conrad Hotel in the Philippines, Conrad Manila, in 2015. Thank you for giving the information. This information will be very useful to me as I was planning to visit this places with my family. Homesteadbangalore is one of the serviced residences which is the wing of Brigade Hospitality.It provides services for customers to feel as home. Its like living in your own luxurious home instead of staying in a hotel.